Washington, Jan 20: The US government began shutting down on Saturday, putting thousands of workers on unpaid leave, after the Senate failed to pass a stopgap budget. The shutdown marked the first anniversary of President Donald Trump's inauguration, media reports said. 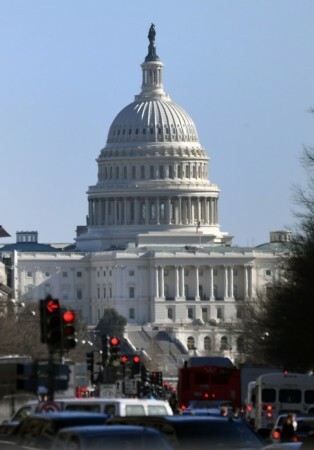 It is the first shutdown in US history to happen while the same party controls both chambers of Congress and the White House, the BBC reported. Despite last minute bipartisan meetings, the bill to fund the government until February 16, did not receive the required 60 votes. The budget proposal presented by the Republicans on Friday night got more votes in favour (50) than against (48), but they were insufficient to approve funds. Four Republicans voted against the bill while five Democrats broke rank to support it. Earlier on Thursday night, the House of Representatives voted 230-197 to extend funding until February. Minutes before the midnight deadline expired, White House Press Secretary Sarah Huckabee Sanders blamed Senate Democrats on Twitter for the "Schumer Shutdown", the New York Times report said. (Chuck Schumer, the top Democrat in the Senate, is seen as the prime opponent to the stopgap budget). "Tonight, they put politics over our national security, military families, vulnerable children, and our country's ability to serve all Americans," Sanders said. "We will not negotiate the status of unlawful immigrants while Democrats hold our lawful citizens hostage over their reckless demands. "This is the behaviour of obstructionist losers, not legislators," she added. Sanders said "the President and his administration will fight for and protect" the American people during the "politically manufactured" shutdown. The rejection of the funding bill by the Senate meant many government services would close down until the budget was agreed upon. The last US shutdown was in 2013 during the Barrack Obama administration. It lasted for 16 days when many federal employees were forced to take leave of absence. On Saturday, Trump wrote on Twitter: "Not looking good for our great Military or Safety and Security on the very dangerous Southern Border. Dems want a Shutdown in order to help diminish the great success of the Tax Cuts, and what they are doing for our booming economy." According to a report in The Guardian, federal law requires agencies to shut down if Congress has not appropriated money to fund them. In previous shutdowns, services deemed "essential", such as the work of the Department of Homeland Security and the FBI, have continued.